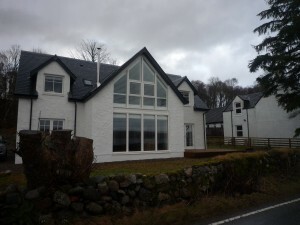 This Argyll holiday house has a stunning view over the loch :-) ...and a road.... :-( ...so it was a rather challenging remit to ensure privacy (the first floor windows are for the master bedroom) whilst allowing in light and, of course, the landscape...oh, but not doing anything that conflicted with the strong architectural lines. The solution was a series of custom-made wooden shutters with wide slats, so that when open, the gaps maximised both light and view. The shutters are also hinged so that they can be folded back for cleaning the windows.